Observation - Zebra. Spider. - UK and Ireland. 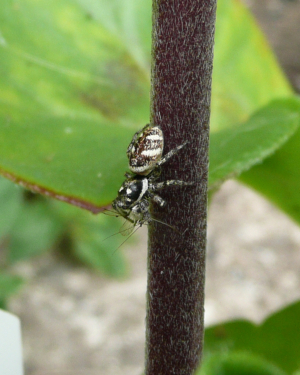 Description: Small black, brown and white patterneed jumping spider lower down on same plant as ladybird larva.see earlier posting.Once again aphid for lunch. Small black, brown and white patterneed jumping spider lower down on same plant as ladybird larva.see earlier posting.Once again aphid for lunch.